Are Cranberry Juice and Green Tea good for Teeth? At the end of this post you will find some research and a list of benefits attributed to cranberry juice and green tea. It’s easy to imagine drinking cranberry juice or green tea will be good for oral health, but before you begin, consider the effect of beverages (healthy or unhealthy) on saliva and its ability to repair and strengthen teeth. Strong teeth are packed with minerals, but these minerals leach out as we eat or drink. Fortunately saliva protects teeth from weakness, because it has the ability to immediately replace any minerals that have been drawn out from the enamel. Saliva is a super-concentrated solution of the minerals needed to rebuild teeth. These minerals diffuse into the tooth as soon as they reach its surface and travel through to repair any weak areas. This process takes about 20-30 minutes to complete, and it can only occur in alkaline conditions and where there is an adequate flow of healthy saliva (which is why acidic and dry mouths are problematic for oral health). Sipping beverages causes disruption of this natural healing process and this is why drinks (especially acidic ones) are a problem for teeth. Before saliva has been given time to replace minerals lost from the first sip, another attack causes additional damage. Even water dilutes saliva and interferes with this natural repair process, no matter the pH of the water or it’s mineral content (since it cannot duplicate the super-saturated minerals in saliva). For oral health, keep drinks to meal times and give your teeth time to interact with saliva as often as possible – especially in the afternoon, when it’s at premium quality. When you read the attributes of green tea and cranberries, it’s important to know the difference between healthy and infected biofilms. Healthy biofilm is a covering that naturally protects tooth enamel from abrasion, chemical, and thermal damage. Mouth conditions influence the kind of bacteria in biofilm, and acidic conditions promote acid-loving bacteria like Strep.mutans. Infection by Strep. mutans grows biofilm into a thick layer known as plaque, and this acid-producing film is responsible for gum and tooth damage. For mouth health we need to promote a healthy biofilm, not work to eradicate it. Perhaps the best way is to keep acidic foods and drinks (including healthy juices and teas) to meal times, and finish each meal or snack with xylitol to alkalize the mouth. This habit prevents exposure to acidity and promotes a healthy biofilm. Xylitol feeds healthy probiotic bacteria, encourages a flow of saliva, and makes harmful plaque slippery and less acidic. When you read the studies, you will see that cranberry juice and green tea can help remove biofilm. This may help reduce the burden in an infected mouth, but it does not translate into oral health. Cranberries may have uses, but not as a cranberry rinse, where its acidity could cause serious erosion. Remember teeth devoid of biofilm can be sensitive, weak, and experience recession and cavities. In the green tea studies you may read of a large group of men who had benefits from drinking green tea. It would be interesting to know if women experience the same results, or do they develop sensitivity and recession? My hunch is there are differences in saliva quality and we need to give more gender-specific recommendations. So enjoy cranberries and green tea, but try to keep drinks to mealtimes whenever possible, and always protect teeth with Zellie’s mints and gum! Cranberries are rich in antioxidants particularly proanthocyanidins, which is the compound that gives them a red color. Cranberry pigments can inhibit biofilm and have been reported to have antimicrobial, anti-adhesion, antioxidant, and anti-inflammatory properties. Contains natural chemicals believed to offer health benefits, and has the highest concentration of catechins found in any natural food. Provides a source of antioxidants (including epigallocatechin 3 gallate- known as EGCG), which may help fight inflammation, especially the kind produced by cigarette smoking. Has a number of useful enzymes, amino acids, lipids, sterols, and minerals. Quality varies dramatically with growing conditions and its beneficial phyto-chemicals are also affected by these factors. Should not be brewed with boiling water, since high temperatures disable catechins, and 160-degree water is suggested. Although some say that dairy should not be added, it appears that any protein-catechin complexes are re-activated during digestion, so this is disproven. Most studies have been on animals, which is why reports state its benefits are unproven. A 2008 study in the journal of the Academy of General Dentistry suggests to avoid tooth erosion people should drink brewed tea. The study compared teas with juice and soda, and concluded there was less enamel loss with tea. 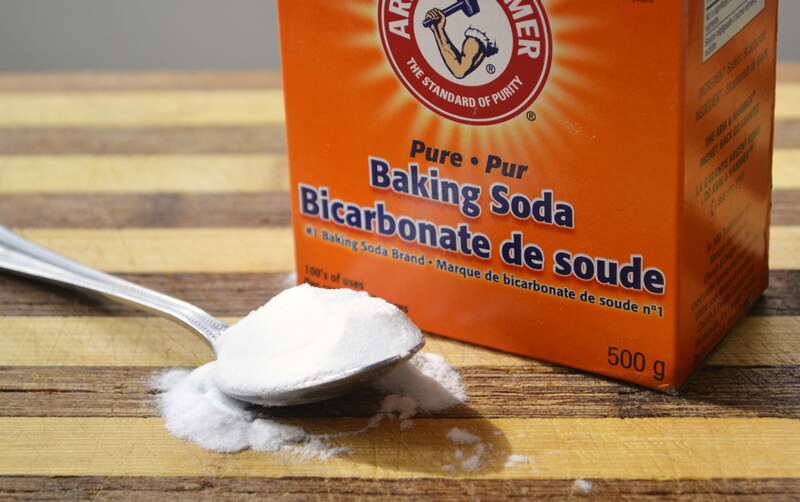 Baking soda (bicarbonate of soda) is a handy cleaning product that is mildly abrasive in solution and is excellent for dissolving grease and molds. It can also be used as a powder to absorb musty odors. For these reasons, baking soda is great in the laundry or for cleaning the refrigerator and the powder can take bad smells from musty old books. It’s easy to be a fan of such a versatile product but be cautious before you join the craze to use baking soda on your gums and teeth. The ADA seems blissful in their recent relationship with Arm and Hammer, running ads for home and professional toothpastes in every journal – but is everyone happy with results from baking soda products? When gum disease was first recognized as a dental problem, the suggested treatment was to cut the gums and reduce the depth of pockets around teeth. Dentists did not know this was an infection but believed poor brushing was the cause. They cut the gums to less than 4 mm (the length of a toothbrush bristle) assuming the toothbrush would now reach the bottom of the pocket. In the 1970s there was uproar when someone suggested a different approach and that bacteria were to blame for gum pockets. In 1978 a dentist called Paul Keyes, working at the National Institute of Dental Research, caused this controversy when he used a special microscope to diagnose periodontal disease, identifying germs in gum pockets and suggesting the revolutionary idea of “non-surgical” treatment. Dr. Keyes used a mixture of baking soda and hydrogen peroxide, followed by systemic antibiotics. Even Keyes describes sensitivity following his treatment and suggested fluoride may help. A mixture of baking soda and peroxide had been used fifty years previously to treat ANUG, an ulcerative gum infection in the teeth of veterans living in the trenches of WWI. This mixture appeared to kill aggressive spirochete bacteria, allowing the gums to heal. Obviously baking soda may be a useful emergency treatment, but beware if you have sensitivity, enamel erosion, or gum recession after using it. Also be aware peroxide can release mercury from silver fillings, and both products may cause the edges of fillings to deteriorate. Over many years as a clinician I noticed baking soda connected with sensitivity, erosion, and gum recession – particularly in women with poor saliva or on mouth-drying medications. My hypothesis is that baking soda may damage the protein layer that protects teeth and gums from mechanical, thermal, and chemical assault. This layer is also important for attracting minerals to teeth, so its loss would cause sensitivity. I never recommend “sensitive” toothpastes because they are a panacea and not a solution, and I often wonder if there is some link between baking soda and the makers of these toothpastes! For a clean mouth I’d suggest you explore my Complete Mouth Care System and cultivate protective mouth conditions. I recommend patients use digestive probiotics because I believe it is impossible to enjoy mouth health without a healthy digestion. Oral probiotics may seem a good idea, but many contain artificial sweeteners like Splenda, that can damage gut health and even promote acid reflux. If you want an oral probiotic, I recommend Garden of Life Probiotic Smile lozenges, which contain strains of Streptococcus uberis KJ2, S.oralis KJ3 and S.rattus JH145, plus xylitol to feed probiotic bacteria. This product claims to safely whiten teeth because these probiotics produce a kind of hydrogen peroxide that comfortably and naturally whitens teeth, without the harsh and damaging chemicals found in other whitening products. Oil Pulling is sometimes called oil gargling and it is an old Ayurvedic method of cleaning the mouth that is said to have originated in India some 2,000 years ago. Currently there is excitement about oil pulling in online articles and blogs, and if you have bad breath or gum disease, oil pulling may be worth considering. This may also be useful if you suffer from chronic illness, asthma, arthritis or fatigue. Sunflower, sesame or coconut oils are the oils most often used, and a small spoonful is swished around in the mouth for 15-20 minutes. Proponents suggest you do this first thing in the morning before eating, and then spit out the milky white liquid – being sure not to swallow it (since it is said to be full of bacteria and toxins). Be careful where you spit out the oil so that the liquid does not go down a drain or onto vegetation, since it will kill grass and flowers. After spitting, rinse your mouth with warm water and then brush your teeth. In essence oil pulling may “pull” disease bacteria away from gum pockets and from around teeth, thus reducing the number of bacteria in the mouth and the toxic burden they create, so eventually less toxins are absorbed by the body. Oil pulling may help improve mouth health for some people, but others should be cautious, since oil pulling can make certain mouth problems worse. A review of the science on oil pulling shows most of the studies are from India and they compare the effectiveness of oil pulling with aggressive mouthwashes like chlorhexidine. These studies show oil pulling may be useful for gingivitis, bad breath and dry mouth, but there are no studies to show it is useful for tooth decay. There are many testimonials from people who say they have experienced healthier gums and fresher breath from using this method of mouth cleaning, and no reports of harm. Some researchers claim saliva interacts with fatty acids in the oils to activate detoxifying enzymes in saliva. Others suggest the oil emulsifies bacteria and loosens them from teeth, cleaning away any fungi at the same time. The most probable explanation is that certain oils contain lignans, which are compounds that have antioxidant and antimicrobial activity. Sesame oil has three lignans (sesamin, sesamolin and sesaminol) and contains high amounts of vitamin E, which could also contribute to the successes. To date there is not much science supporting oil pulling because the studies were too small, too short, or incomplete. This does not mean oil pulling is not useful, but be aware it does not appear to control cavities and is not recommended for very young children, especially those with early childhood caries (ECC). In addition anyone with gum recession or sensitivity should approach oil pulling with caution, since this technique may damage biofilm and pellicle proteins, essential components of a healthy mouth that govern mineralization and support gum health. For this reason oil pulling should probably be a short-term or periodic adjunct to oral care, recommended mainly for people fighting periodontal disease. Cavities and Dental Disease: Why they occur and how to stop them. Cavities, filings, gum recession, lost teeth, root canals, periodontal disease, and implants can all easily be prevented! Treatments and Preventive Strategies: Use of xylitol, diet, supplements, and methods to control, balance, and sustain oral health at all ages. Myths and Truths: Facts about what really causes oral health problems and what actually works to prevent and stop the disease. Q & A Session: Ask Dr. Ellie your specific oral health questions and concerns. **Seminars to be held in Austin, TX and Auburn, CA in October 2013!